At last! 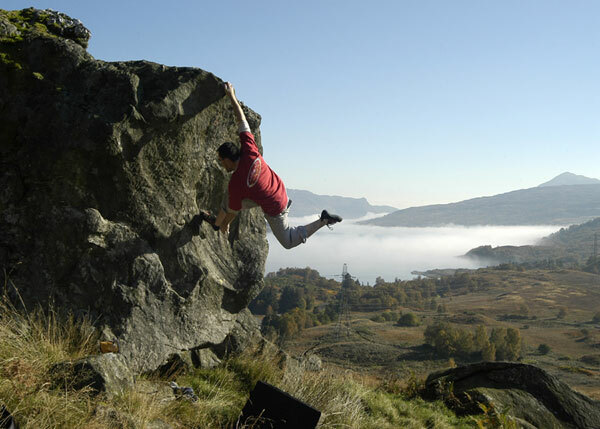 After a stalled bouldering season, the high pressure has nudged in and settled the skies, the weeps are finally shrinking and withering at Dumbarton. While the Aberdeen crew have been lucky to have had dry conditions at Clashfarquhar, here on the west coast Dumbarton has been green and soaking for two months. 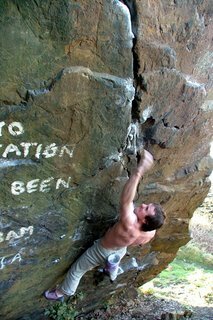 Today I managed to get down and find some dry rock, working a few moves with Dave on some suddenly obvious unclimbed lines - it always surprises me that a little time off from a favourite venue refreshes your 'eye' and you see things that were not obvious when you're there all the time. Anyway, a small step as I managed to get the heel on the project again and 'look' at the next hold (yes, even that's an improvement to a boulderer) with Dave managing to go further and throw for the final move, which resulted in a couple of spectacular dynamic body swings, the resulting coiled tension propelling even the spotter into the brambles... a lot of pent-up energy after the dark ages of this autumn! ...of rain... which has put paid to the Scottish bouldering scene for this year... everything is weeping and green, we need a benevolent high pressure to restore some normality to the bouldering scene, everyone's frustrated by the deluge, and it doesn't look like stopping. Grabbing windows of opportunity between the fronts is the only option and running the animated satellite forecasts is like watching the old broken back of Scotland being whipped by sadistic Atlantic fronts. 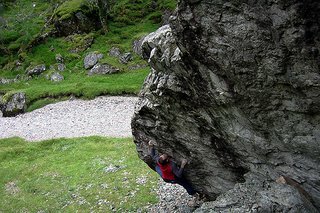 That said, I squeezed in a pleasant afternoon at St Bride's wall near Strathyre... a quartzy bulging wall with perfect landings and some good testpieces, just after the parking for the Ben Ledi walk-in. 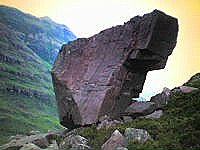 It is not extensive, but in bad weather it is only two minutes walk and facing south, so it's worth a visit when the higher boulders are not worth the risk. It catches the sun and a few hairy-knuckled gestures from passing white-vans, which you can feel free to return. The main lines are fingery straight-up highballers, but traversing right and descending the quartz crack is more sensible after the rain has greened off the top-outs. 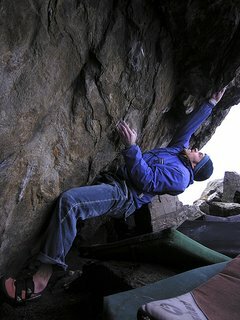 Projects remaining include the low traverse (broken holds may have made this harder) and the Bulge direct ... (may be the line climbed by Kev Howett in the 80's 'Grey Matter') - this is a fingery looking nightmare into the 8th grade somewhere... with quartz nubbins and slopers from hell thrown in! 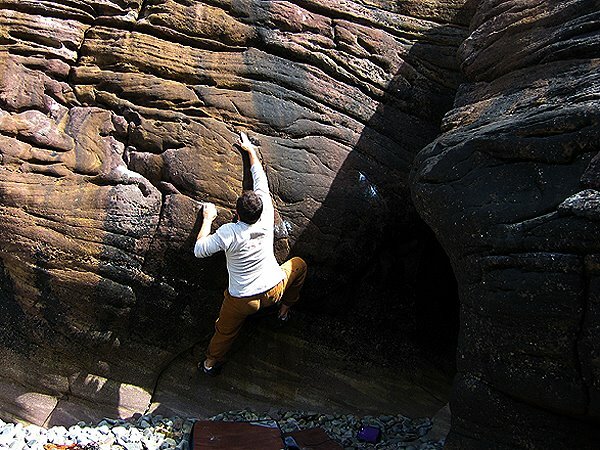 I managed to tackle the bulge from the quartz seam side, cranking up a nice crossover sequence on the seam to a high and unhelpful sidepull, where body tension allows the feet to smear on and the sidepull becomes operable. Slapping out right to the said quartz sloper, a moment of insecurity follows before better holds come... an excellent Font 6c+/7a, let me know your thoughts! Alan Cassidy has reported an intriguing new version of Dave MacLeod's Smokescreen, originally a desperate Font 8a+, it has now been reclimbed at a more amenable grade of Font 7b+ . 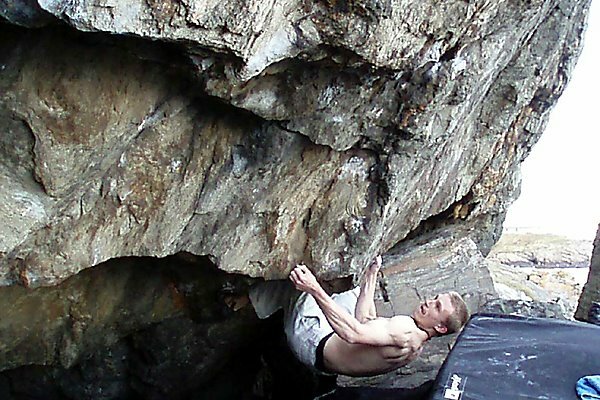 Alan said he discovered a go-again slapping sequence that got him up the crux hanging slopers. It goes to show that there are often other perspectives to problems, and that it is worth trying all sequences on your projects just in case... it also shows how rich our climbing world is... other people can often produce radically different results and it is worth absorbing as much as you can from watching other climbers. It's where you learn all your technique after all. Well done to Alan for discovering a sequence that will make this tespiece more accessible, I hope Dave is not too disappointed to hear the news... it won't make Pressure any the less impressive, but will mean there is an easier finishing sequence. That said, finishing up Firestarter is the next big challenge in this never-ending game of rock poker! 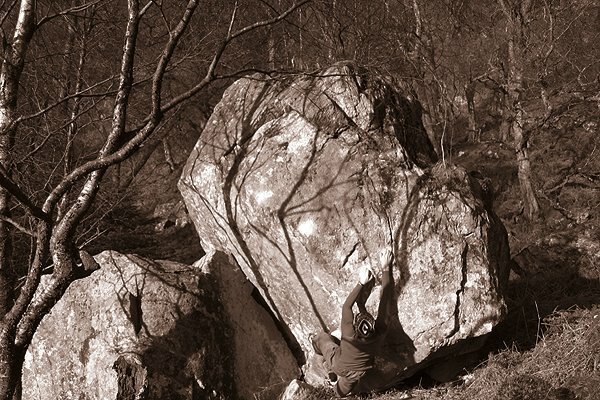 You would be forgiven for thinking Spain a hot limestone potato balancing on the nose of Africa, too hot and steamy for bouldering, one for the sports climbers maybe. Well, a little research and googling dragged up some interesting counter-points. 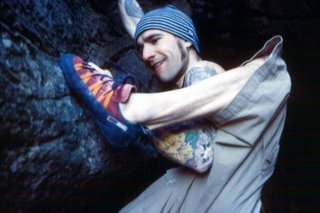 The mountains are cooler, anything over 1000 metres and the Pinus Negris forests hide boulders and rocks entirely alien to the geological bully that is limestone, and the temperatures are more convivial to holding slopers. What I found hidden up here looked suspiciously like the clean red Torridonian sandstone of the North West of Scotland, nestling in the cool shade of pines. There was one online topo and a few photos that persuaded me to book flights to Valencia. The place? 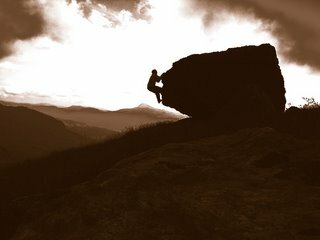 - ‘Albarracin’. 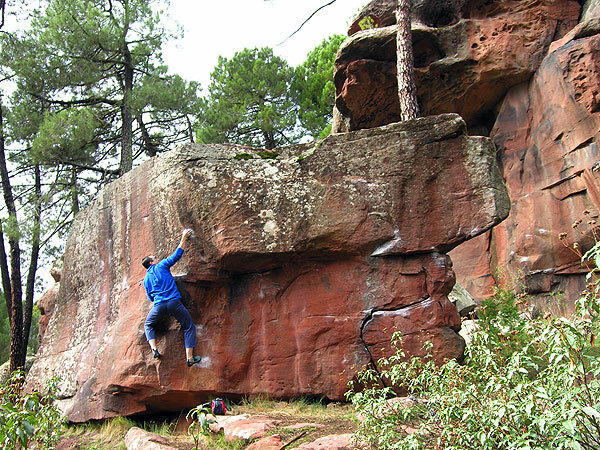 Albarracin is a remarkable medieval town perched precariously on rocky slopes in a deep valley in the Montes Universales. These mountains lie west of Teruel (two hours drive north from Valencia airport) in the province of Aragon. A ten mile straight road along the Teruel plain leads suddenly into a winding limestone valley with deciduous trees and flowing rivers. The road winds up to the trumpet blast of the walled town that is Albarracin. The town behaves like it was banished to a remote corner of the Spanish classroom, with its pointy dunce cap of a church spire. It crowds in on itself with charming introspection, narrow alleys and leaning houses provide a maze of trendy bars and restaurants, all perched on top of each other in a noisy palimpsest of classic Spanish architecture and culture. 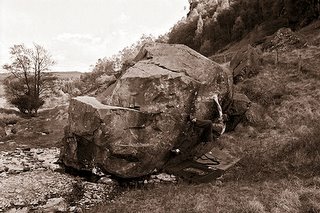 It is a fine place to visit in itself, but just outside of town, leading up to a rocky plateau covered in pine trees, is a choked gorge that wouldn't be amiss in a Hollywood western... large red sandstone walls and buttressed boulders leaning every which way. The road below the walled town breaks left over a river by the excellent basement Bar Molina de los Gatos (the local climbing bar with climbing magazines, bouldering photos, chilled locals and plenty flowing beer…) and winds up to the plateau and a large car park, where German camper vans and small huddles of boulder-mats suggest this is a major new European bouldering venue. The plateau is vast and disappears over rolling pine-clad hills with tempting buttresses peaking out on the escarpments. Most people come here to visit the remarkable 'pinturas rupestres', which turned out to translate as ‘cave-paintings’. The caged-off petroglyphs are good way markers for the boulderer and worth a circuit themselves… 'El Arquero' is probably the most evocative: a lunging archer with dangling appendage on the verge of the kill... other pictures depict the hulked backs of bulls, surprised deer, the hunt in full flow, the gentler beginnings of animal husbandry and other ghostly abstractions of a harder life in a place I now see with the leisured eye of the 21st century. I have come looking for a bouldering paradise in a rented Seat Ibiza… and am thankful for such luxury to enjoy parts of the planet such as this. 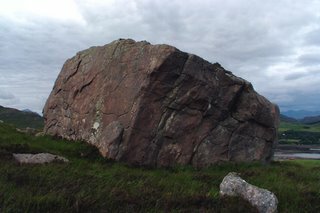 I wandered aimlessly and eagerly through the forest getting lured along by better and better boulders, chalked-up problems appeared here and there… the whole place reminded me of a Fontainebleau before the gold-rush. The only people I saw were mushroom hunters wandering in circles with baskets, occasionally shouting to colleagues when they found ‘rebollons’ or such-like delicacies. 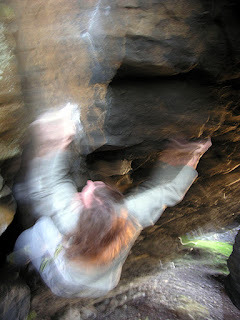 I was hunting for rock mushrooms, perfect shapes, morphic bells of movement as it were... I was not to be disappointed. 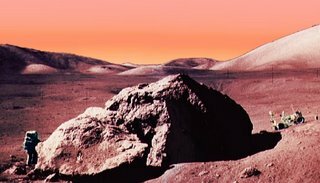 The red sandstone varies in quality, but the areas are extensive and good problems can be found round every corner, or in alleyways of boulders and walls. Landings are generally good and sandy, but you do have to watch out of the odd tree-root or embedded boulder. 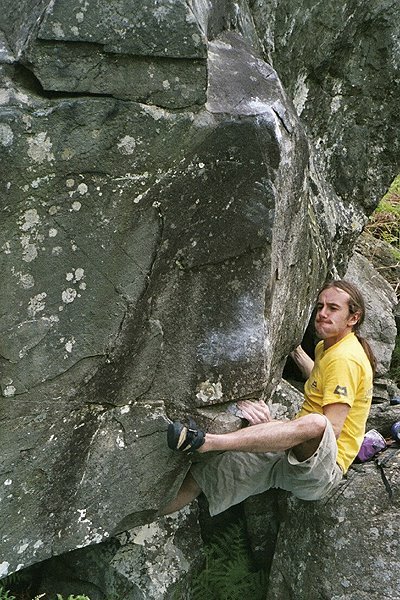 There are slabs, lots of roofs, rounded perched blocs and flying buttresses…the full gamut of the boulderer’s requirements for a classic venue. The weather is generally cool and sunny, though I had picked the wettest week of the year in November. Despite that, it dried off enough to bring the locals out…they were found in noisy encampments round new projects further afield from the obvious areas round the car-parks. 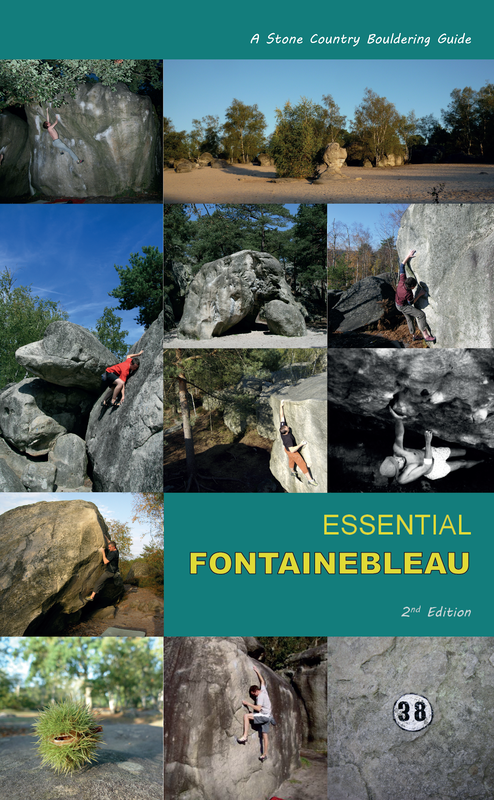 It's that time of year when your bouldering soul aches for the sandstone of Fontainebleau! After the wet spitballs off Hurricane Gordon, the weather is finally cooling down and projects tremble at the thought of crisp cold autumn conditions. If your tendons last out and you've ramped up the power, this is the best time of year for the Scottish boulderer, as long as a little luck plays out before the nights draw in. 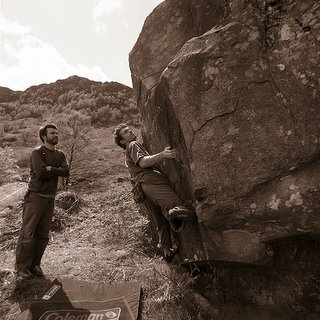 Glen Nevis in the autumn is a truly special place for any boulderer. 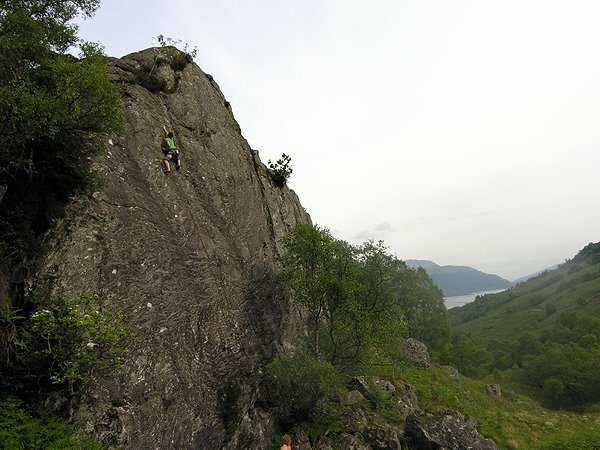 The fine-quality schist and excellent situation of High Crag, as well as a perfect grassy alp for landings, make this a favourite haunt of the dedicated boulderer. 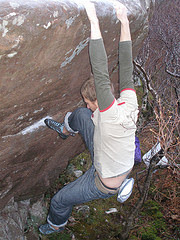 Dave Cuthbertson originally saw the value of this overhang and created some hard traveres such as Beatle-Back and Tinderbox, which are worth the walk up. 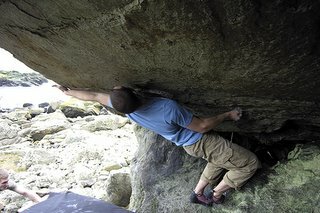 The bouldering projects and straight-ups are hard, most problems above V8, but of note for a single visit is the excellent technical problem that is Auto-Roof. 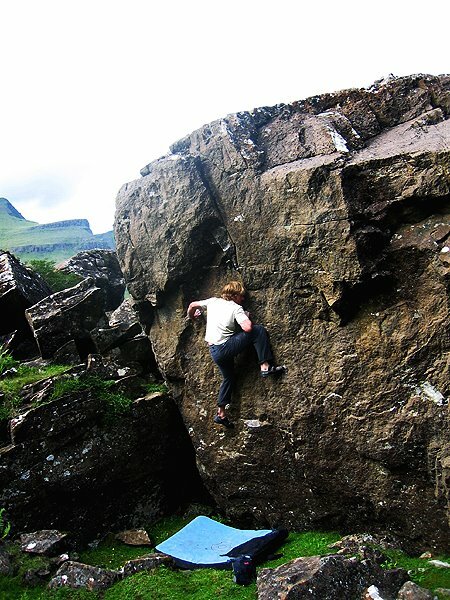 The problem finds a way through an impending wall to a jump-off niche where the route continues but eases off. The standing start, off an embedded boulder to the left, is Font 5 and requires good pressing power to gain a blunt undercling, then a slap right for another good but blunt side-pull allows a jug to be gained in the niche. 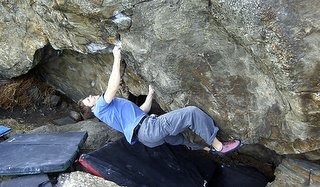 Straightforward enough, enjoyable steep pulling...but it becomes a classic problem when you sit-start low down and come in from the right, making the good high holds problematically out-of-reach... which is what needs solved. 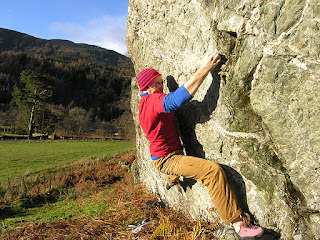 The sit-start comes quick enough with good body-positioning and hand cleverness... an awkward finger slot for the right hand allows a quick powerful pull to a left-hand sloper/crimp, then a reach to a protruding flat block. Now the fun begins... gain the imperfect undercut to the left, position the toes and crank up the power to slap with your right hand to the higher holds of the stand-up. 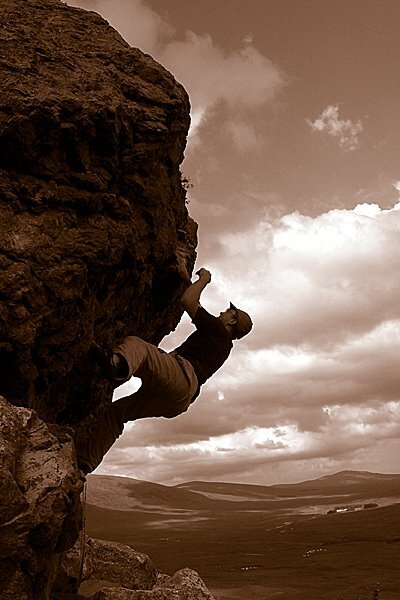 If you manage this move, it's straightforward to the top. 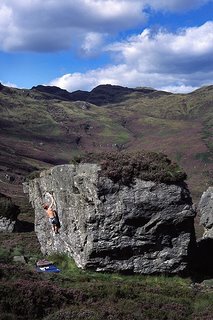 Though better known for the excellent trad cragging, no self-respecting trad merchant should pass this problem by if in the area. 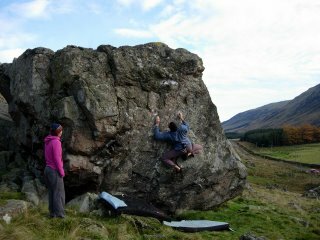 If you can flash it, you should be well good for E4 cruxes - it is the obvious leaning wall above the road on Glen Clova's biggest boulder. An excellent landing means you can start this at sit-level and fall off as many times as you wish at any point... a couple of brisk power moves get you off your bum, then a tricky press move to the left allows a good incut up right...now comes a decision, either wimp out right on nearby jugs, or commit to the big move to a poor left hand-hold just below the lip. If you manage to hold it, keep your technique steady and mantle over the top. 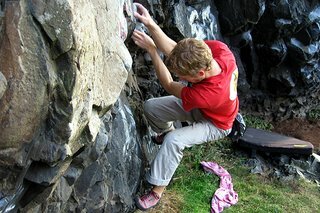 Sorting your feet position for the crux lunge is crucial (try a heel-hook on the sloper if you're feeling weak). 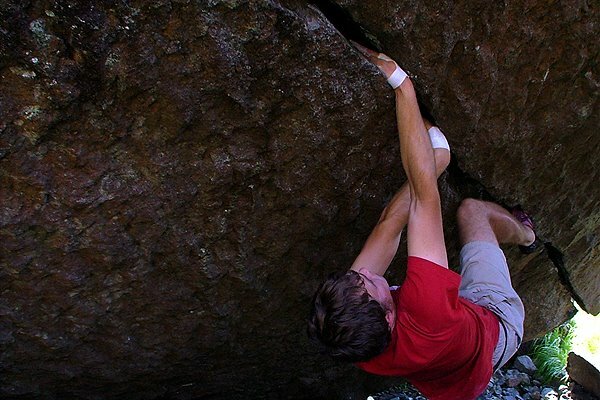 If you're strong, you might want to try cross-handed... it's hard either way. 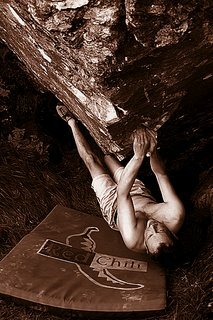 which is how I feel about my bouldering sometimes - lots of energy and plans and optimism - the reality is a little trickier. Take the Shelterstone, for example, a tremendous mountain crag, (The Needle, Steeple...) you go here for these classic routes and the beauty of howffing in the Loch Avon basin, but who considers the bouldering? 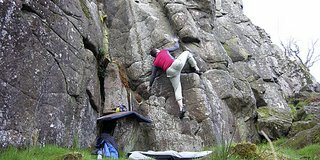 Most people who have climbed here have bouldered on the litter of giants beneath the crag - Julian Lines has done a pile of problems, Gary Latter etc. - a lot of climbers have quietly bouldered here a little when visiting to climb the bigger routes. 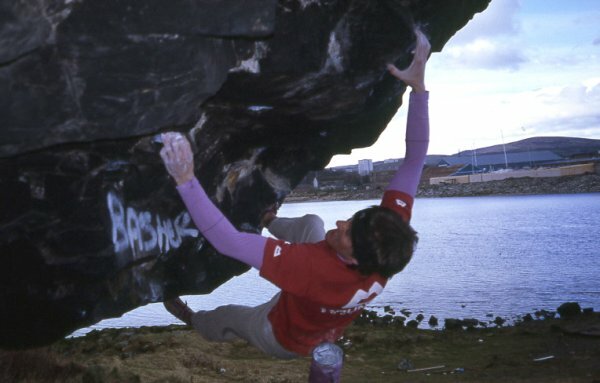 I'm sure Robin Smith even warmed up on a few aretes. 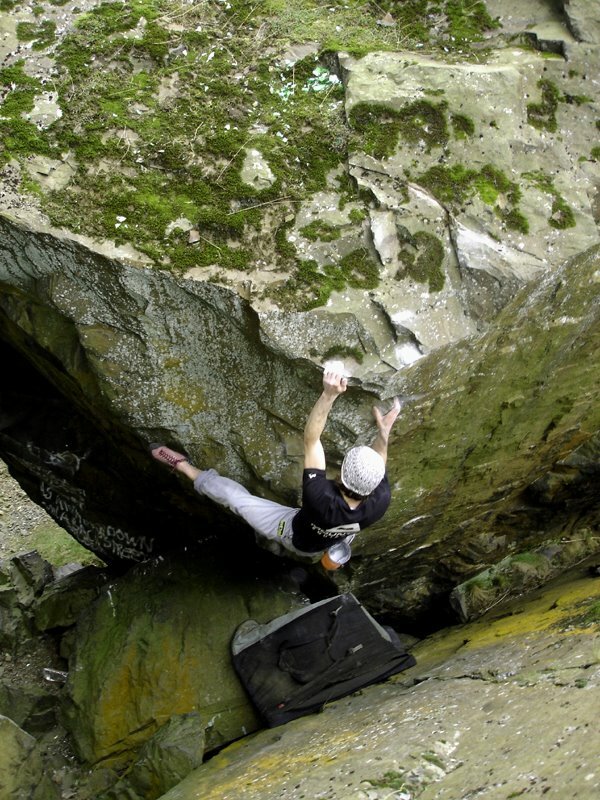 But in terms of pure bouldering? Very few bother, what with the walk-in - a three hour trek, especially with boulder mat - and you most definitely don't want to tear ligaments or worse in this corrie - it's a LONG crawl out and don't expect your mobile to help you out - it will be good for playing golf or pinball on till the batteries run out, that's all. But there is potential, and lots of it. 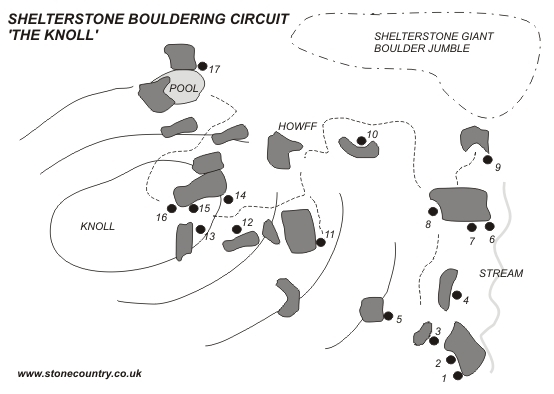 There's an excellent circuit of safe problems up to Brit 5c on the boulders on the grassy knoll below the main scree - I'll post a topo soon for this. 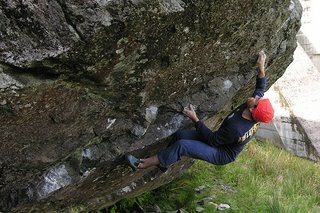 There are also some choice Brit 6a and 6b problems on the steeper walls, again with reasonably safe grassy or boggy landings, but there are some well-hidden roofs and almighty prows to be climbed by, yes, you guessed it, those with potential! 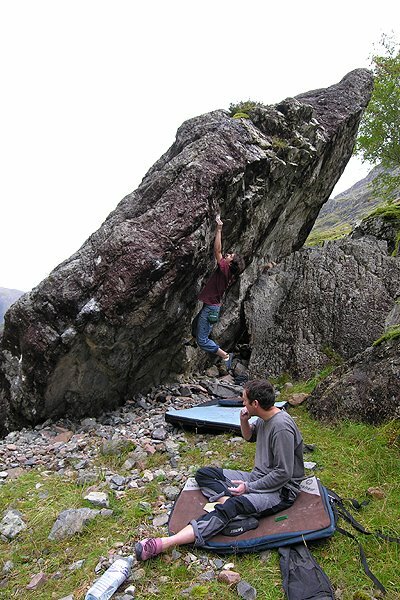 If you are planning a bouldering trip here, there is no need for a tent. Take a warm sleeping bag stuffed in your mat, as there are loads of howffs - it's like a stony version of Hobbiton for God's sake! 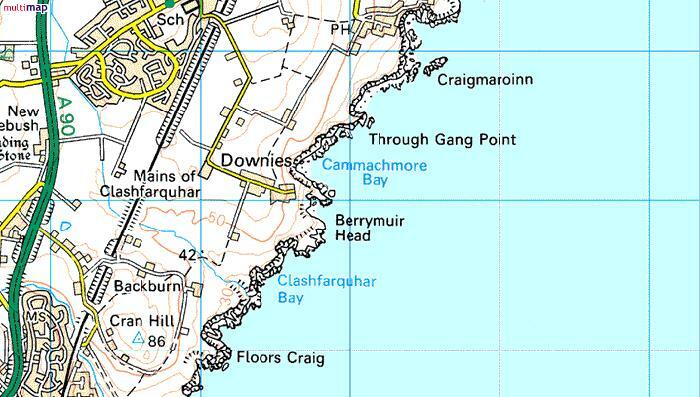 Take a stove and something good to eat, and a quarter of your favourite hooch to sip on the excellent beaches by the Loch. 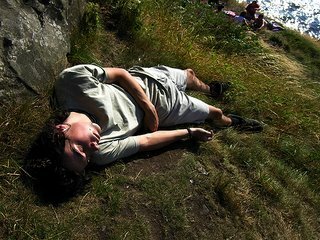 The midges are not west-coast style and there's usually a breeze. To get there? 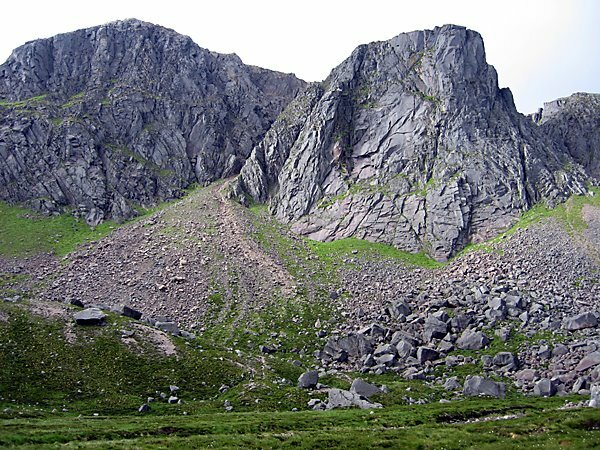 Take a map and compass in case... park at the the ski centre, walk along the excellent track into Coire an t' Sneachda, over the 'goat track' under the cliffs and straight across the grassy plateau and down the steep Coire Domhain past Hell's Lum crag- you'll see the boulders ahead on the perfect grassy knoll, below the giant boulder that is the eponymous 'Shelterstone', though there are plenty of contenders for this name! Find a nice spot to howff, then go bouldering... the circuit problems all have tell-tale pink wear on the crucial holds. Classics include the diagonal tip-toe crack on the 'Stream' boulder, the crack by the 'Pool' boulder and various flying aretes... I'll post some photos end of the summer. Not a bad intro! 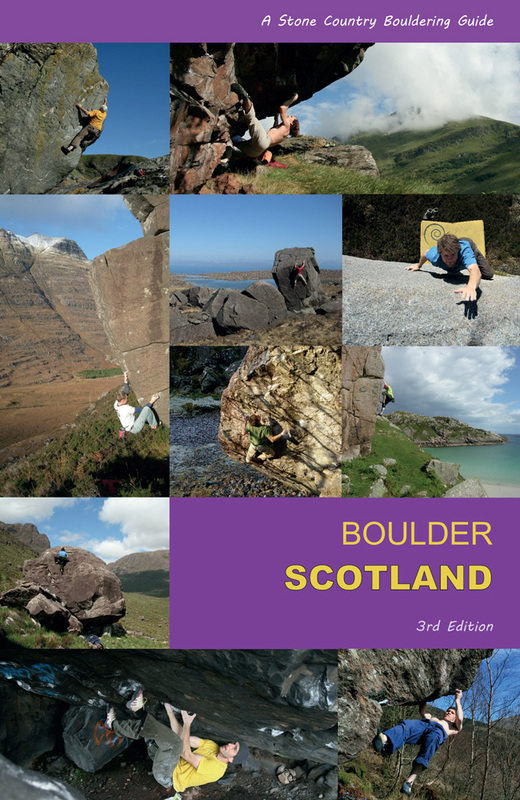 This is a labour of love and serious attention to detail, a quality addition to the bouldering topography of Scotland. James Sutton and Lee Robinson have produced an excellent map-guide to the bouldering on Skye, bringing clarity to the jumble of boulders in the great gabbro corries. The first thing that struck me was the simplicity of the layout, an A3 fold-out that packs neatly into a waterproof sleeve. Bird's-eye-view maps at 1:2500 scale locate you easily, numbered boulders refer to hand-drawn boulders, clearly marked lines and full descriptions, with V and Font grades... 39 diagrams, 150 problems... packs a punch all right. 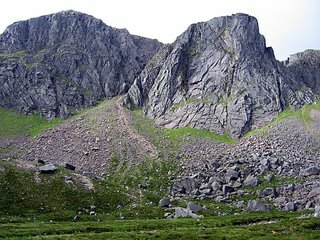 Culnamean, Ghrunnda Boulders, Coire Lagan and An Sguman. 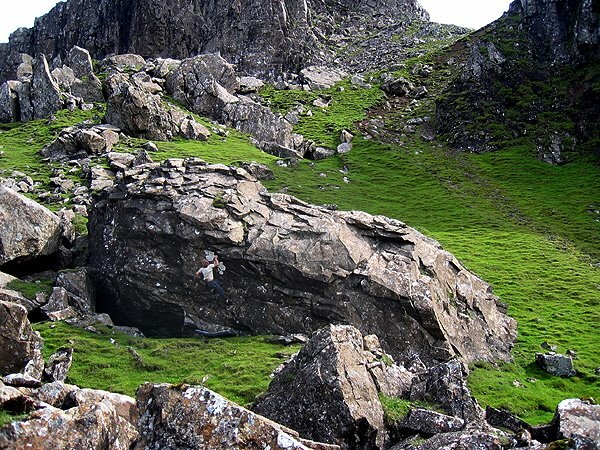 Other areas mentioned are: Carn Liath, Skinidin, Elgol and An Caol on Raasay, though the concentration is rightly on the rough gabbro of the Coires. There are some excellent pics of classic problems such as Duck Boulder Arete, Snake Attack, Pump Up the Jam, Criss Cross and a classic shot of Ben Wear wiping off The Chieftain face out!! I noted the inclusion of Si O'Conor's 'hard' problems with interest, having had my own share of frustration in trying to give Si the benefit of the doubt when it comes to cutting-edge problems. There is no doubt these lines exist as 'lines' and have been located by James, though Si still has to take responsibility for his claims and provide some core evidence of actually linking and climbing them. 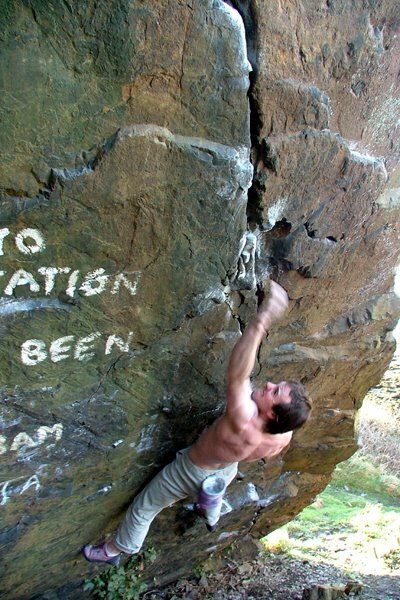 They are insanely blank propositions even to an experienced eye and to date Si has smoke-screened everyone who has tried to climb with him or film him on these problems... the author's own photographs are not enough to suggest full ascents. I guess James and Lee have shown a similar philosophy of generosity (describing Extradition, It's Over and Paper Tiger etc). Future guides and literature will not be so generous, I fear. Well done boys... good production and an inspiring inventory of passion! 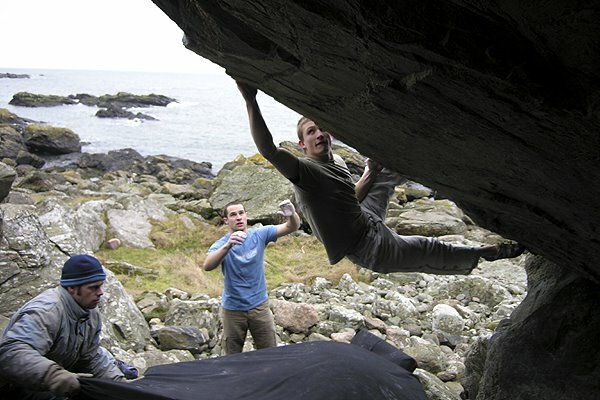 Chilled out bouldering venue, just south of Craigmaroinn. The Bay gets all the sun going and nesting puffins can be seen on the cliffs above and seals and porpoises in the water below. 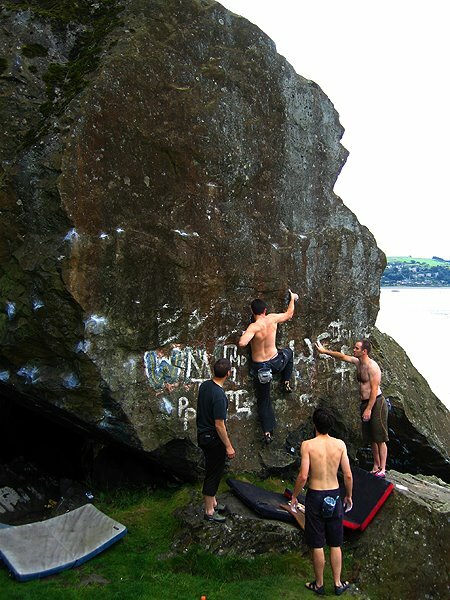 The climbing is on a variety of large and small blocs and walls on beautiful water washed schist. A good spread of grades is available. The only draw back is that mats and good spotters are definitely required. The boulders can be approached in two ways. 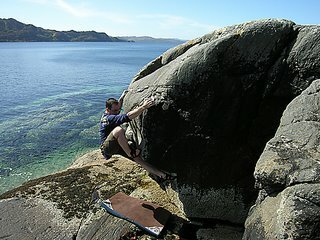 At very low tide by heading straight down the path towards the sea from the turning area at Downies, turning left at first col on the ridge to Gorillas Head, heading toward obvious â€˜yellow headedâ€™ boulder, then walking round the bay past The Dark Side boulders to the main area. 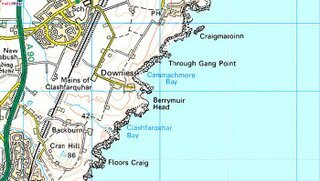 If not possible then follow costal path north briefly before heading straight down vague path in the centre of headwall of bay. Time 3-5 mins. 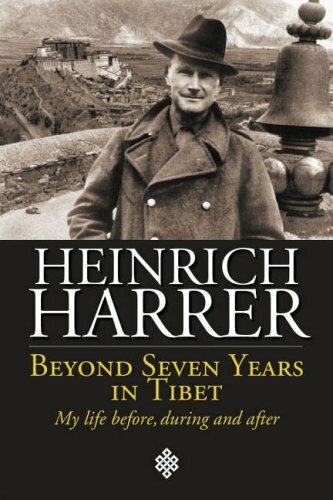 The first publication in the English language of the autobiography of one of the worldâ€™s most well known adventurers: Heinrich Harrer who died early in 2006. Best known in book circles for his bestsellers Seven Years in Tibet (1953) and The White Spider (1958), this book brings to life those and his many other adventures. Heinrich Harrer, traveller, explorer and mountaineer led one of the most extraordinary lives of the twentieth century. He famously spent Seven Years in Tibet (made into the film in 1997 starring Brad Pitt as Harrer himself) and was tutor, mentor and a lifelong friend of the Dalai Lama. 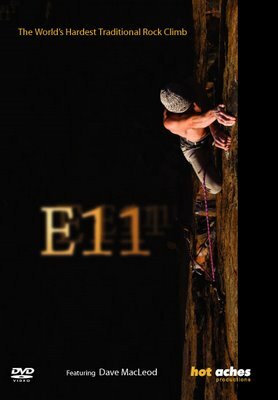 He made the first ascent of the notorious North Face of the Eiger in 1938 (told in his book The White Spider). 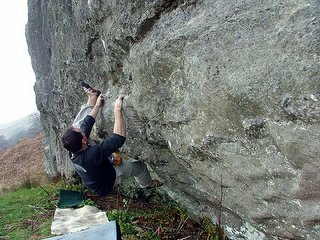 The Eigerwand had been a scene of carnage in the years preceding Harrerâ€™s success - an achievement partly overshadowed by the perennial debate over the extent to which the climbers were â€˜sponsoredâ€™ by the Nazis. In this dramatic autobiography he brings to life all of his adventures, from the early days of climbing in the Alps, through his time in Tibet, to his later expeditions including exploring the Congo with the King of Belgium and travels to remote parts of Asia, South America and Africa. 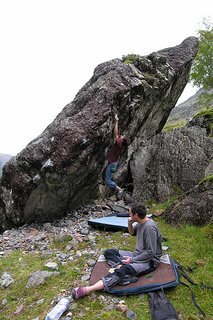 Tony Simpson and Mike Adams were on tour in Scotland and claimed a few new lines at the Applecross boulders. 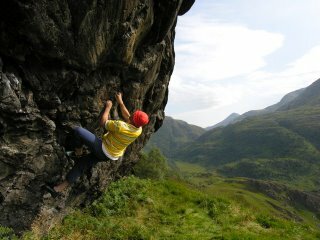 They climbed the wee hanging groove on the downhill face of the Kishorn Stone, at about Font 7b V8 - very hard without a cheat-stone! There are fine hard problems from the lads and well done to them for persevering and sampling the delights of the North West. 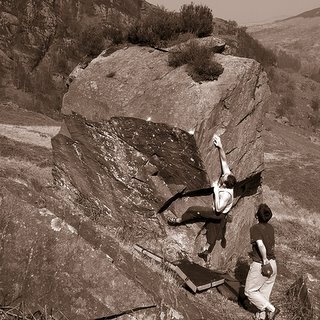 "It was put up by Malcolm Smith last June (I was getting close then too but he beat me to it!!). 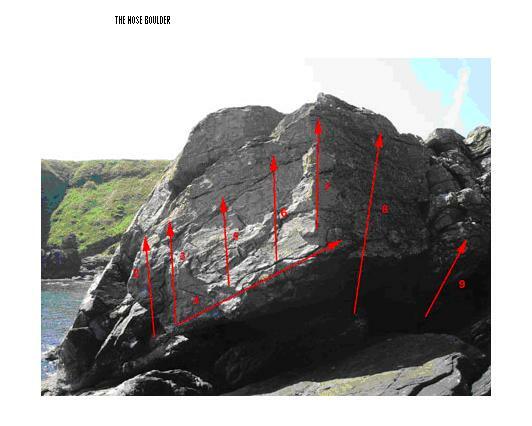 It takes a big diagonal line across a 40 degree face on the boulder, linking up several problems with no let up. 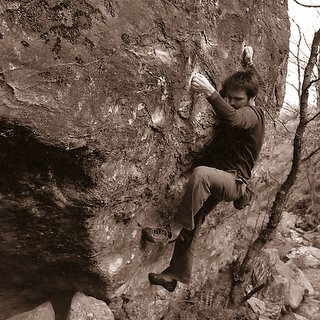 Basically Font 7a traverse into Pongo SS. Up this (Font 8a) and reverse the traverse of In Bloom (Font 7c) into Slap Happy Font 7a to finish. About 30 moves in total." 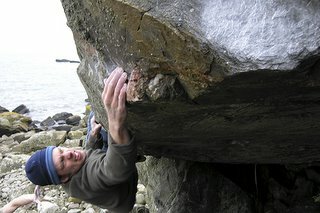 Dave has now done all three Font 8b's in Scotland, the other two being Pressure and The Perfect Crime, both at Dumbarton Rock.